How has this superb footage of the former Beatle and his wife Yoko Ono, captured at their home-studio, remained unseen for almost 50 years? The doc features unseen footage from John and Yoko’s Berkshire home where much of it was recorded, is as close as you’re going to get. There’s testimony from musicians who played on the album, plus interviews with Yoko and eldest son Julian Lennon. But it’s John who commands the attention, bashing out his songs on the upright piano so the band can learn them, and telling fellow ex-Beatle George exactly what sort of guitar solo he’s after. This wasn’t so much the untold story of the making of a classic album as a fascinating addendum to an iconic story which had already been told in the companion film released by Lennon, Yoko Ono and director Steve Gebhardt in 1972, and fleshed out even more in Andrew Solt’s tribute Gimme Some Truth. Here director Michael Epstein took the story further. 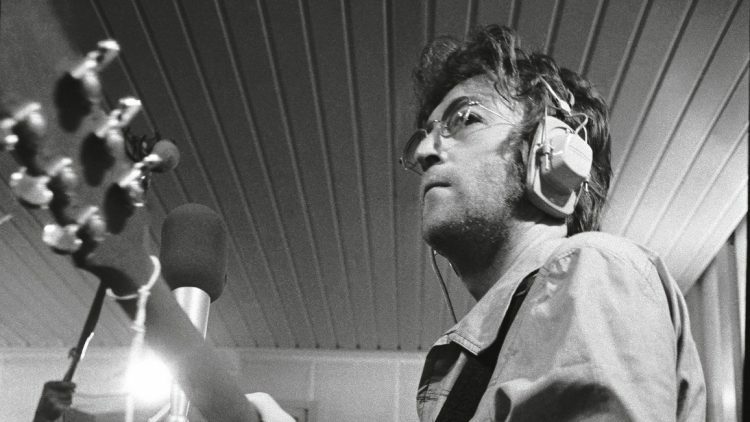 He had access to Lennon and Ono’s personal archive and, for obsessives, unearthed previously unseen film footage writes film critic Gerard O’Donovan from The Telegraph. A Vietnam veteran shows up to John & Yoko’s doorstep claiming John Lennon’s songs are about him. Directed by John & Yoko, this was originally filmed on 22 July 1971, and is now seen with its full original intro sequence. A brand new transfer, taken from a first-generation 35mm inter-negative of the original 16mm Imagine film negative. Restored and remastered for the very first time in a stunning new digital transfer. John Lennon and the Black Panthers. 45 years ago, John Lennon invited a founding Black Panthers member onto a famous American talk show. The issues they discussed then are just as relevant today.